Even better than the original Wine B' Gone. Advanced formula, fast-acting! Even better than the original Wine B' Gone customers hail as "the best on the market." Advanced surface-active agents remove wine stains faster and safer than ever from clothing, upholstery, carpets, sinks, countertops... just about anything. Removes coffee and many other stains, too! Wine B' Gone Ultra contains surfactants, safe solvents, and stain-reducing components, and has no phosphorous, peroxide, or chlorine bleach. It is pH neutral and will not adversely affect colorfast washable fabrics. And, it keeps colors vibrant and whites whiter without oxidizing agents. Does the wine b gone works on fabric like silk??? Yes I used it on a silk romper. It wasn't a wine stain but an oil based stain that the drycleaner was unsuccesful at removing. But the Wine B Gone took it right out. I let it sit o the stain for a few minutes then rubbed the area for a minute and hand washed after. Looks perfect. Good Luck! Yes. It works very well on all types of fabric. By start with just a little bit to be sure it doesn't affect the fabric. Personally, I couldn't live with out the stuff. I am such a clutz! It works on all fabrics, I have used it on a silk blouse, cashmere sweater and cotton! No issues! I can’t read the directions for use. How do I use this product? BEST ANSWER: For clothes, I just spray and wash. For carpet, I just spray, let it set for a short time and then use a dry cloth to draw out any extra liquid. For paint in clothes, I use a little paint thinner (with just a little water), rinse in water and then applied Wine B Gone and washed regularly. PAINT WAS ALL GONE! spray and gently massage, blot dry after a little wait with cloth underneath to accept any residue from going back into fabric - standard procedure for these things but this one really works! Check out the product's website for specific instructions. Good product. BEST ANSWER: No, this is not for leather, it is for colorfast washable fabrics; upholstery; carpets; furniture; laundry; stainless steel; platinum, gold, silver, and diamond jewelry; sinks; plastic items; cabinets; countertops; glassware; and hands. This works on a sealed leather (like car seats), but be sure to test small area first for color fastness. If the leather isn’t appropriately sealed, wine b gone may remove color. I can’t read the directions on the container. How do I use this product? BEST ANSWER: Apply immediately but for fabric check for colorfast by applying to an out of sight area, let stand for 10 minutes, rinse and dry. If OK apply to stain, rub gently , wash or rinse with water, repeat if needed. Works really well in my experience. Things are never what they advertise ... but this IS! Spilled red white on a gray shirt. Sprayed it on - blotted - and it was gone... and it didn't bleach the shirt. Awesome! Also used it on a chocolate spot on the carpet. Took that out too! This is a true miracle product! Wow! I am absolutely amazed by the effectiveness of this product! Although it is great for wine stains, it also functions as a stain remover for other disasters as well. For instance, I spilled hot sauce all over the interior of my car (which is light tan) and fabric. I was absolutely horrified and didn't know what to do until I remembered I had Wine Be Gone! I sprayed the stain and rubbed with paper towels, then poured water on the area and repeated a few times. Within ten minutes the Wine Be Gone had fully taken the stain out of my car! Now that the area has dried, there is no remaining stain! I also noticed that the Wine Be Gone took the dirt stains out of the rug as well! Overall an amazing product and would highly recommend. As head of my church altar guild, I deal with red wine on fine Belgium linen every week. I’ve tried other wine sprays, but this one works the best. Every wine drinker should heave this. You never know when spills will happen. 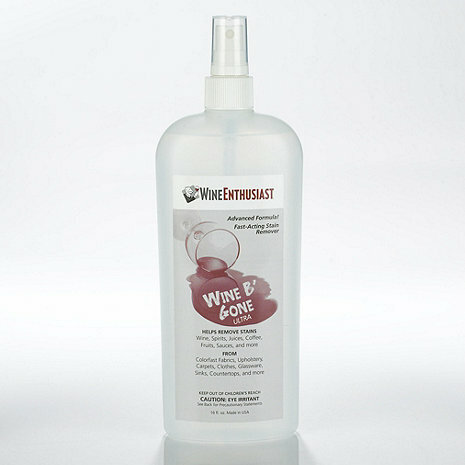 Best product we’ve ever found/used for wine stain removal. And it works on other stains as well. Highly recommend! I purchased this product several months ago but hoped I would never need to use it. Unfortunately, I recently spilled a glass of red wine onto a light tan carpet. After one immediate application of this product as directed, the stain was gone but a slight shadow persisted. After a second application a couple of days later, the shadow was gone. To my complete surprise, this product was 100% effective. I highly recommend it to anyone who likes to drink red wine. Just in case the need comes. Hopefully now having it will result in no spilled red wine. With no spills yet I cannot attest to how well it works. This stain remover is not just for wine. It is also good for pre treating all stains on clothes before washing!. If you like Red wine, this is essential! I keep a bottle in the laundry room and one in the kitchen -- close at hand in case of a wine spill. I also always order one for my brother's family. A travel size is nice for vacations. This truly gets out the wine stain within minutes! Love this stuff. Used on residual stain accumulation at the bottom of a frequently used Spiegelau burgundy glass. I had to let it soak about 30 minutes or so and used a light brush, but presto...no more stain. Also used to remove a very small red wine stain from a light colored sweater, after the dry cleaners gave up! This stuff is great and works as advertised (all too rare now days). I used this product on a "dry clean only" dress and was careful to apply a bit to a Qtip to spot dab the drip of red wine which disappeared and left no ring - love this! This product is miraculous !! After trying several recommended ways to remove several large crab apple stains that were brought into my home last Thanksgiving by young children on my beige Berber carpet the stains were still there. I thought I'd have to purchase new carpeting. Wine B'Gone removed the almost one year old stains on the first application. It was truly an amazing product ! Love this stuff. It has saved many a garment, tablecloth, etc. I am never without it. As soon as I see that there is only 1/2 bottle left, I reorder immediately and several of them. I also pass out as presents. After using, my giftees alway tell me how grateful they are to now have this product in their home. If used before wine dries, it is quite impressive, but, one would expect a workable spray bottle with this expensive product.